I finished these works only recently, but they are the last of the finished works so I'm repeating them here. I apologise if you're seeing them for the second time. The triptych of embroideries is based on a series of images by Dr Adam Hamlin, showing areas of the basal forebrain with healthy cells, dying cells and where wholesale cell death has occurred. Using hand-dyed silk pearl cotton on black silk shantung, I've represented the images in an abstract way. 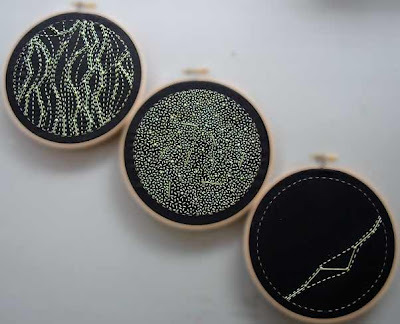 The healthy cells are stitched in French knots, straight stitches and running stitches that are connected and orderly: this is a brain that's in good working order. In the middle work, the stitches are all present but they are disconnected and chaotic: the brain and thought structure is breaking down as the cells lose their integrity and die off. In the final work, there are only a few stitches in a void of destruction; however, I have made these connected and orderly as a sign that all hope is not lost – neurogenesis may still save the day.